20% Tougher Sidewalls: featuring race-proven CoreGard™ Technology to take on the toughest road hazards with confidence. 2X the Treadlife on Gravel; 15% longer Treadlife on Asphalt: to extend your adventure. 10% better Traction in Mud; 19% improved Traction in Snow: exceeding RMA Severe Snow Traction performance requirements to confidently get where you want to go. 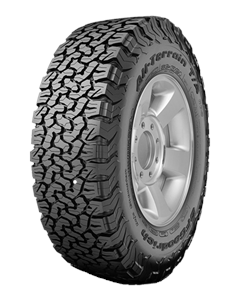 Sorry, we currently do not have any tyres with the All Terrain T/A KO2 pattern in stock. These guys are really professional. Did exactly what they committed, at a fair price with excellent communication. Would unreservedly recommend from my first experience. Will be back thank you. Very happy customer. Consistently good prices, super helpful and friendly staff, and massive range of tyres. So good to have a place like this on the doorstep. Excellent service. Thoroughly nice helpful guys. didn't rip me off either - going back with my other car on saturday. Would definitely use again. A Very helpful company with the best prices in the area. Always very happy with the services I get. On time, very efficient and very friendly.